Now that’s a personal assistant! DirecTV has now added an Alexa “skill,” inviting disgruntled cable customers to use the Amazon smart speaker to help them unsubscribe. 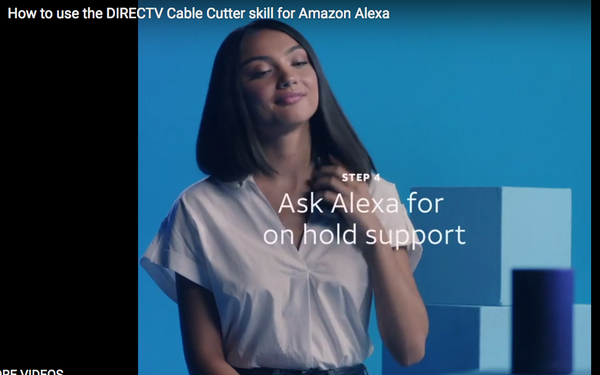 Once you say, “Alexa, help me quit cable,” Alexa will "connect you directly to a cable representative so that you don't have to navigate the phone tree, deal with (other) robots, or spend your whole day on hold,” the ad says. Actually, a user first has to go to the skill page and enter a link that tells you how to do it. But the fun parts are depicted in a YouTube video produced by Organic, Inc. in Los Angeles. When the cable customer asks Alexa to help her quit cable, she responds in that now-familiar, strangely inflected way she has: “I’ll help you escape the 'never-ending' cycle of cable frustration.” Then she suggests, “Would you like to do a quick meditation to get grounded before the call? I know these types of things can be maddening.” Later still, she warns the customer she’s going to get lots of new offers to keep her subscription and teaches her how to say “no” in nine languages. Cable TV has lost 1.1 million subscribers so far in 2018, according to the Kagan research group, and there seems to be a irreversible migration away from cable to streaming alternatives. But while DirecTV is being helpful, things aren’t going perfectly well with it, either. It reported in October that it lost 359,000 subscribers in the third quarter on top of the second quarter when it lost 286,000, which up to that time was the most it has ever lost. And its streaming alternative DirecTV Now gained only 49,000 customers, far fewer than the 296,000 that service added in the same period a year earlier.